First Trials Begin For Those Charged Over Inauguration Day Rioting : The Two-Way The Justice Department is prosecuting nearly 200 cases of felony rioting, and the defendants could face decades of jail time if convicted. Jury selection for six defendants started today. 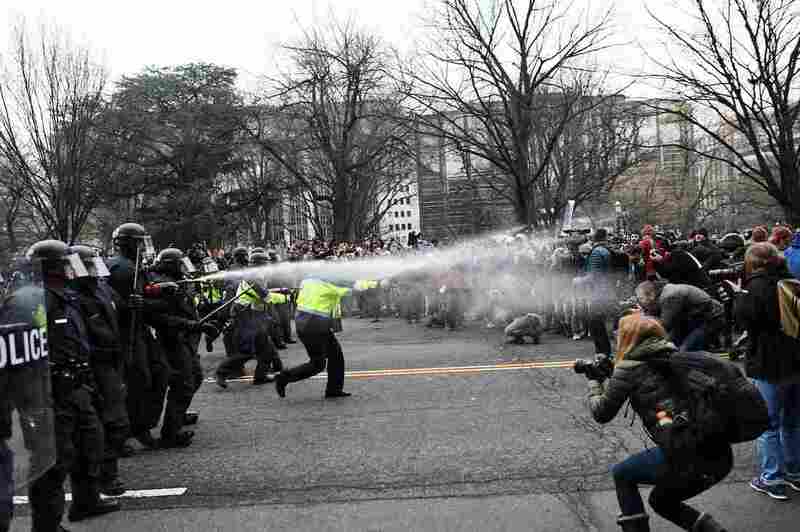 Police and protesters face off on Jan. 20 in Washington, D.C., during President Trump's inauguration. More than 200 people were arrested and charged with rioting. Jury selection began Wednesday, and opening statements in the first trials are set to begin next week. It's been nearly 11 months since President Trump's inauguration, when major protests took place in the streets of Washington, D.C. Storefronts and vehicles were damaged, and police used pepper spray and other tactics to subdue the protesters. D.C.'s Metropolitan Police made scores of arrests. Eventually, 234 people were arrested and charged with felony rioting. As it stands, 187 people face felony charges of rioting, and seven face misdemeanor riot charges, according to Justice Department spokesman William Miller. Twenty cases have been dropped, and defendants in another 20 cases have pleaded guilty — all but one to misdemeanors. Michelle Macchio, 26, of Asheville, N.C.
Brittne Lawson, 27, of Aspinwall, Pa.
Christina Simmons, 20, of Cockeysville, Md. The defendants, who are represented by different attorneys, could face decades in prison if convicted. Each is charged with six felonies: one count of inciting or urging to riot and five counts of destruction of property. They also face two misdemeanor charges, of engaging in a riot and conspiracy to riot. Miller told NPR on Wednesday that Armento and Harris had also been charged with one misdemeanor count of assaulting, resisting or interfering with a police officer. But he later said that wasn't accurate: "That particular charge was dismissed by our office last summer for all those defendants (approximately 100) who faced it." The criminal cases are being prosecuted by the Justice Department. In the District of Columbia, the U.S. Attorney's Office functions as both the local and federal prosecutor. Judge Lynn Leibovitz will preside over the cases in D.C. Superior Court. One of the defendants, Alexei Wood, is a freelance photojournalist and videographer. His attorney told The New York Times that he faces up to 61 years in prison if convicted. Wood livestreamed the protests on Facebook, and his video captures a chaotic scene. A voice that seems to be Wood's occasionally says "Wooo!" amid his narration of events: protesters bashing the windows of a limousine, figures in black charging at a line of police, who have penned in the protesters. As police release what appears to be pepper spray, Wood pulls on a gas mask. As his trial has drawn near, Wood has shared regular updates to social media. "Honestly, rough day y'all," he wrote Tuesday on Instagram. "Trial starts tomorrow! We, the Nov 15th trial block, will not be getting our charges reduced like Dec 11th trial block did. 'Prosecutoral digression.' Yup, so random people put into a trial block just got most of their weight lifted." The "judge found my statements, uttered on my live stream, ARE admissible as statements to conspiracy," Wood added. "This feels terrible." Opening statements are scheduled to begin Monday. The Department of Justice said it does not comment on pending cases. In a related case, the ACLU of D.C. is suing the District of Columbia, its police and its police chief "for making unconstitutional arrests, using excessive force, denying arrested people food, water, and access to toilets, and invasive bodily searches of protesters exercising their First Amendment rights on Inauguration Day." Last week, the government dropped its case against Desiree Fairooz, who had been arrested for laughing during U.S. Attorney General Jeff Sessions' confirmation hearing.